Thanks to all who took the time to play along!! Congrats Wendy!!! Please email me at nicolle@creativeembellishments.com to get your voucher code. Happy May friends!! It’s already time for another challenge!! I have decided since there has been very little challenge entries on FB I am just going to move it back here to the blog. Please simply add your entry to the inlinkz tool/button below. Create a NEW project layout, mini album, tag, card, canvas, etc….as of May 1st, 2018. >It is required that you mention in your blog post that you are playing along at Creative Embellishments together with a link back to our blog page. Please make sure to reference our challenge. Please, no old projects. (meaning projects from previous months that may fit the challenge) Please share only new projects. >Please add your entry to the inlinkz tool below to be eligible for the prize. You have until the last day of each month 11:59 pm eastern time to enter. >Simply add a link to your FB photo (if you do not have a blog) featuring your challenge entry. Let us know how you were inspired by the photo. Now onto the amazing DT reveal!! Hello! It’s another new month: MAY @ CREATIVE EMBELLISHMENTS which means another monthly challenge for a chance to win $50 in their fantastic products! I did a set of Artist Trading Cards (ATCs) and I just LOVE the way they turned out even considering that vintage is not unusually my forte!-so GIVE IT A TRY! We’d love to have you! Creative Embellishments Products Used: ATC tag set #2 The whole background ATC : I sprayed the tag with Color Bloom Antique Gold and added a stenciled brick pattern to the right of each ATC FLOURISH: I cut pieces off of this flourish and place on the lower left corner and dabbed w/white ink. My favorite addition is the MINI DRESS FORMS which I also dabbed with a bit of white ink. 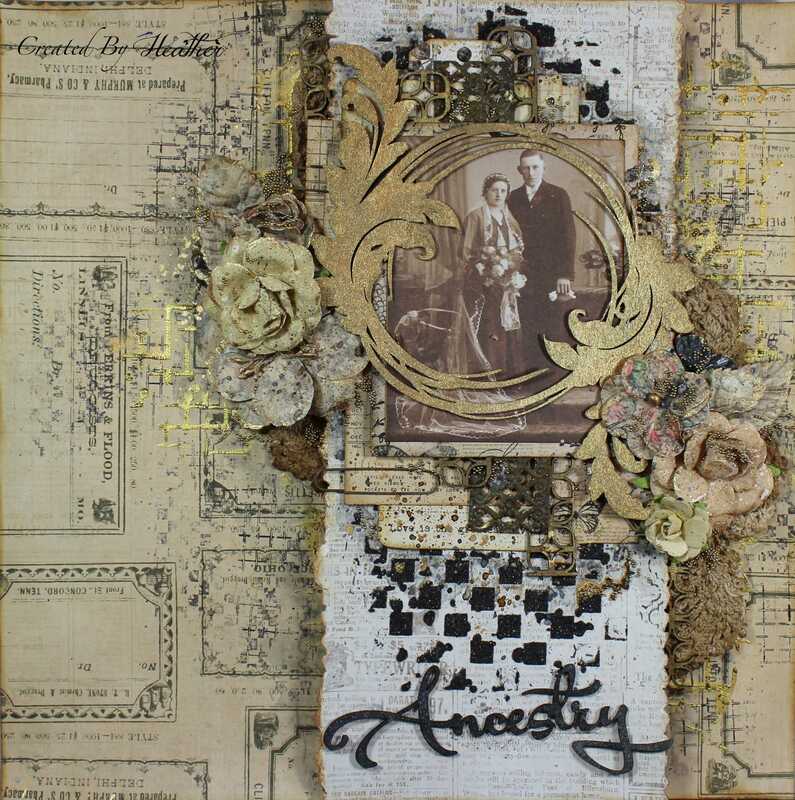 A new challenge this month at Creative Embellishments, and this one is so awesome, I love anything vintage and old and this is perfect. So I actually don’t have any pictures of my own family. But you find old photos out there on the internet. I started the page with some stamping and texture with the distress grid stencil, and I layered with more texture with the distress checkered stencil. So adding the flair with flowers and doilies what else help make it vintage other than gold and shadowing. Using the Vines Flourish Frame I coloured with some gold spray. Lots of layers of paper and the square lattice panel, I topped it off with some pretty gold micro-beads. So here is a video to help inspire you to play along. I love the challenge this month as vintage styling is one of my favorite things! I made an easel card and and matching large tag from the Large Tags set. The vintage image on the tag is framed with the Infinite Rectangle Frame and underneath the flowers I used Flourish Set 10. 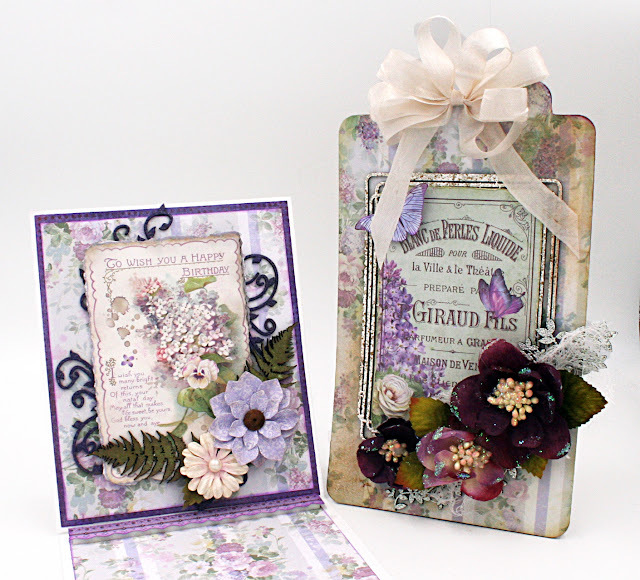 I heat embossed both with Stampendous Shabby White Embossing Enamel. I love easel cards; they are easy to make and present themselves so prettily! I used fern leaves (stained with Lindy’s mist) from the Fern Foliage 5 set and layered Flourish Corners 2 underneath the vintage image. I heat embossed the flourishes using Ranger Antiquities Tanzanite embossing powder. I can’t wait to see what you make with vintage images, this is going to be a great month and challenge! Hi…. so how are you today? I am totally enjoying time at home in Canada again. I am in my scrappy space again playing wtih amazing Creative Embellishment accents. For this ancestry looking page I used photos of me, my gramma and my mom. Everything is soft and compliments the black n white photos from August 1951. On this page I used a 6×6″ bubble panel for photo backgourn, I added some smaller punchinelaa pieces to compliment the bigger panel and I used 2 types of words – Girl Word set and basic alphabet letters to create the title “Precious Memory”. The page was started with some paint splatter stamping and stenciling and was finished off with a great cluster of flowers with lace. Be sure to visit the STORE to view these products and so many more. Hi everyone! For this months challenge I giant tag to add to a very special gift for a bridal shower, with the twist being a photo of her grand parents on their wedding day. I started with a one of the pieces from the Large Tag Set. I framed the vintage photo with pieces form Flourish Heart Frame Set 1. To finish it off I added in pieces from the Moroccan Lattice Panel, a few chippys hearts and the sentiments is from the Happy Word Set. Have fun playing along and I can not wait to see what you make!!!!!!!! For this challenge, I created a vintage inspired card featuring a nostalgic image of a retro lady. I framed the image with a Large Clock Face 3″, which I decorated with glitter glue. Besides, I also incorporated three Mesh Pieces on my card to create a nice backdrop on my card. The mesh pieces were only lightly inked with brown distress ink. We would love to see what you create. For a chance to win a $50.00 gift voucher to the store remember to share below in the link tool. No way!!! Im so happy!! I've been making a wish list ever since I saw the shaker box post!! Thank you so much!!! Fabulous entires to the challenge!!! I also added some nice creative embelishment chipboards on my layouts! Hope this time I get this prize. Been trying since a while!